The North Country Cheviot (N.C.C.) 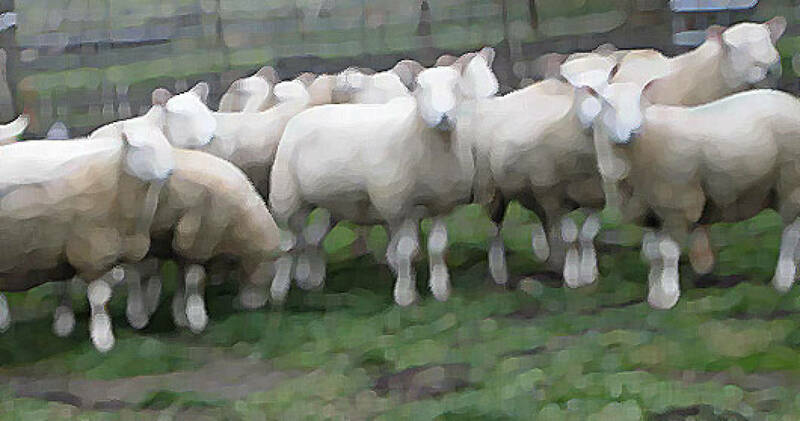 is a distinct breed of white sheep native to Northern Scotland. The North American version has a different appearance, but our Breed Standards remain. General Appearance: N.C.C. has an alert, bold look with an erect ear, on a chalk white-haired head upon a deep, broad, long, white, woolen body. HEAD: Covered with short glossy white hair, long erect ears, a slightly to moderately long Roman nose distinctly characterize a North Country. Wool should not come beyond the back of the poll on top nor beyond the back edge of the jaw. Nostrils are full and black. Eyes should have a black outline. The mouth should have the lower front teeth squarely meet the upper dental pad. N.C.C. are hornless, but lightly colored scurs are permitted in exceptional rams. Long, all-white ears are preferred, dark spots on the ears and poll no larger than 3/4 inch in diameter are permitted. NECK: N.C.C. have strong necks of medium length that taper smoothly to the shoulders. SHOULDERS: These sheep have good width between shoulder blades, which are meaty and even higher than the back line. The rams have muscualr shoulders and forearms. CHEST: The chest should be broad and deep with ample room between forelegs and with slightly less width and depth than hindquarters in females. BACK: The back should be as straight as possible, (except shoulders are often high), the rest should be strong, wide and well fleshed. The rump is level, well out to the dock. RIBS: The ribs should follow the broad and deep chest, well-sprung and deep. LEGS: The legs are covered with short white hair below the wool line. The hooves are black. N.C.C. is known for its heavy muscled rear legs. The legs have strong pasterns and are medium long in proportion to size. The thighs are full to the shank, firm and meaty on the inner face, with obvious muscularity on the outer, or stifle region. FLEECE: The white fleece is light shrinking, not hard, but has a spongy feel. It is free from curl, hair, and kemp. Wool grades of 1/4 to 3/8 blood, 50 to 56 count. SIZE: Mature rams should weigh 225 lbs. and up. Mature ewes should weigh 175 lbs. and up.